Listen To What Your Mouth is Trying To Tell You. Like eyes are the windows to your world, your mouth is the gateway to complete health. Changes in color and texture in your mouth might indicate that your overall health is not good and you need a medical examination. 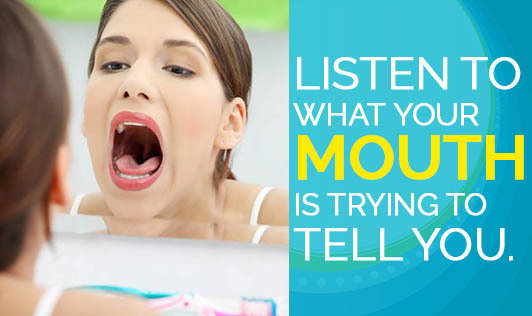 Examine your mouth once a week and check for these signs. If it looks pale: It can be due to a low hemoglobin count. Include lot of vegetables and bright colored fruits in your diet. If you are non-vegetarian, you could increase your intake of poultry, lean meat and fish. If you suspect anemia, then consult your doctor for further examination. If your tongue has a thick coating: It generally indicates an aggravation of a disease which can be due to any disease causing bacteria or virus. Thick and stringy saliva: This condition is called "dry mouth". It can be due to severe dehydration or can be due to certain medications (pain, cold and allergy). Dry mouth is very common in diabetics. If left untreated, it will lead to gum disease, tooth decay and oral yeast infections. Try to increase your water intake, chew sugarless gums, and use children's toothpaste for brushing your teeth as they have comparatively less drying ingredients. If these measures do not work, then let your dentist treat you. Men and women aged above 30 should examine their gums more carefully. If you see your gums bleeding after you brush your teeth, it could possibly be due to a gum infection. Gum disease can also be a sign of diabetes. Studies from The American Academy of Periodontology show that pregnant women with gum infections are more prone to premature deliveries. Research shows that gum disease increases the secretion of biological fluids that induce labor. Meet your dentist at least twice a year to maintain good oral health.